012. ROBERT F. SCOTT. Issued by Birds Eye Foods Ltd. (1978). It is card number 12 from a set of 30 cards entitled "Wonders of the Seven Seas". The card was given as a free premium with the company's food products. Size: 2.75" x 1.5"
Verso in blue ink: Cap'n Birds Eye's | Wonders of the Seven Seas | Card No. 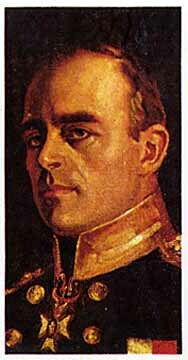 12 | SIR ROBERT | FALCON SCOTT | (1868-1912) | In 1911 Scott arrived in the Antarctic; and while completing the work of an earlier expedition, he established "One Ton Depot" 130 miles along the route to the Pole. On lst November he started for the Pole, using dogs and ponies to the foot of the Beardmore Glacier. From there to the Pole (81 miles), and back, the sleds were drawn by hand. On reaching the Pole in January 1912, Scott found that the Norwegians had arrived a month earlier and on his return--tragically delayed by bad weather--he and his remaining companions died on 29th March, just 11 miles from "One Ton Depot."